It's a very good release. ⦁ Brand new copying module dubbed the "ultra copier"
⦁ Pre/post-commands now launch .bat files via "cmd /c ..."
This is a big change, which was long due. The central piece of code that shuffles data from a file to its backup copy was completely redone. The previous version is still perfectly fine, but it is now several years old and we've learned a thing a two during that time. ⦁ Faster in bulk copying and faster in processing of smaller files. the speed over regular bulk copy. may cause, while preserving as much of existing data as possible. * Not that yanking a drive is ever a good idea though. Additionally, the ultra copier looks at the exact drive type (HDD, SDD, NVMe, etc. ), USB connection details and a network protocol version to adapt its IO profile for the setup. If you have some time, do read through the linked posts. It's one of more interesting changes to the program in a while. Starting with this release the backup engine will retry backup steps when they fail in a certain way. By default, the retrying is enabled for network-related failures as this is the number ones source of intermittent failures that tend to resolve themselves in a short amount of time. The retry schedule is 20 times 15 seconds apart, configurable as per usual. The engine already had a list of so-called "fatal errors" which cause a backup run to be aborted when encountered. This list includes errors like "Device not found", "Volume dirty" and everyone's all time favorite "Disk corrupted". By a popular request, it's now possible to disable systray icon blinking when a periodic backup misses its scheduled run. The error will still be logged, but the icon won't blink. UI's ini file *was* saved in response to Windows "we are rebooting" notification, but it was initiated _after_ the UI responded to the latter. So in some cases Windows ended up nuking the program before the save was completed. 1. The engine erroneously skipped symlinks that were pointing back into the source tree. This is a _folder_ processing logic (because we'd end up in a loop if we were to allow that). File symlinks we should be following regardless of where they point. 2. When copying a file via symlink, the engine used wrong API to query its size, so it ended up always thinking the size was 0. This would've not been a problem if the engine didn't have an optimized copying routine for zero-sized file. This routine works by creating a backup file and then closing it write away, without attempting an IO. This was due to the program being started twice in rapid succession. Previously the engine would force-flush file buffers after copying each file if the backup device was removable. In retrospect this is not really needed, because it's a duplicate of Windows' per-device write cache policy, which is what needs to be changed IF a device is indeed prone to sudden removals. That is, when enabled, delta copying is now used for all files over 64 MB and for recently-modified files over 16 MB, whereby "recently" is "within last 30 days". As it turns out it's NOT a default behavior of native Windows controls. In some configuration windows there's a plaintext "More" at the bottom right corner. It used to be dark gray, so some people assumed it was a disabled option and never bothered to try it... even though it changed color invitingly on hover. As of this release, these are blue. Looks a bit more busy, but hopefully a bit more actionable too. Previously, it would say "Destination is a subfolder of the source" and refuse to OK the setup. If a pre/post-command ends with ".bat" and the whole command is a filename, then the engine will launch it with "cmd /c <command>". This is an internal change that cleans up the initialization of the default exclusion list. Just rest assured that it's all tidy and neat there now. These went out over the course of past few days to patch an issue each. was not a multiple of 64KB. misplaced panicking on its part. is at it again, breaking things with recent W10 updates. ⦁ Added support for "final" qualifier to default exclude/include rules. paths using current date and time variables. *disk* load in addition to just lowering program's process priority. on a single-core CPU, in which case you should see no difference. archving ".abc" it ended up being saved as " (2018-08-01 ...).abc". That is with a space in front of the opening brace. No more now. the backup copy (e.g. because of the network error). read more concisely in collapsed form. went wrong" under certain conditions. a part of the logging module cleanup. bugs in statements that verified correctness of the code, in real-time. but the backup file wasn't yet closed. ⦁ Fixed an issue with copying NTFS alternate streams on Windows XP. and panicked when it saw no required API support. so off center that it was clipped. it for no apparent reason or explanation. to launch itself at user's logon, when set to run as Administrator. account or the computer itself was renamed. a backup job. In certain cases the program would panic and exit. only reported case it was NVIDIA. to be retained in the backup than required. recommended if you are running 79.8.
job to archive just modified files and not deleted ones. even when there were no real changes. being set too wide and tall. ⦁ Resolved an issue with file system information querying/caching. internal rework of the backup prep phase done in 79.9.
successful authenticated connection to a publicly inaccessible share. erroneously thinking that it still didn't have a connection. 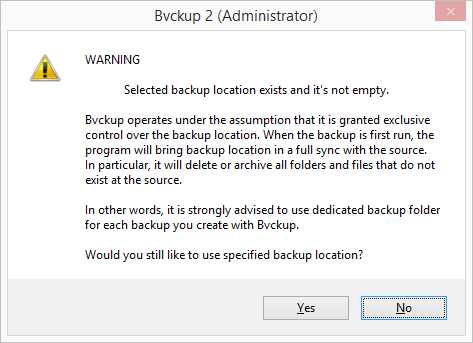 fields in the Backup Settings dialog when collapsing "More section"
seconds apart when running into this condition. Retry parameters are configurable through the INI. Retrying is enabled only when "More Options" > "Shadow Copying"
is set to "Require", and not for the "As needed" setting. ⦁ Speeded up saving of destination snapshots at the end of a backup. ⦁ Suppressed logging of deduplicated files during the scanning phase. were unconditionally logged before this change. ⦁ Changed the layout of About window a bit. 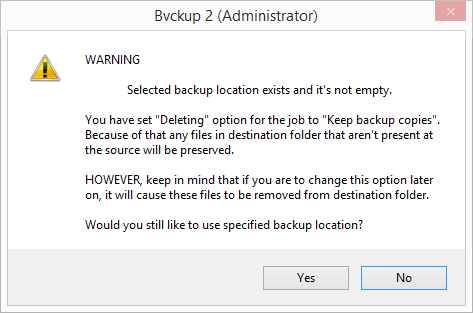 ⦁ Fixed tabbing order in the Backup Settings window. ⦁ Fixed Ctrl-A support in edit boxes. code to eliminate occasional flicker during fade-ins and fade-outs. ⦁ Fixed an issue with the UI not showing changes in backup state. The issue surfaced when running without Administrator privileges. reporting and tracking down this issue. The cause of the issue was a trivial mistake in the code that tried reading some VSS-related information without first checking that VSS was available. This led to an "Access denied" fault, which should, under normal circumstances, trigger a crash. So it should've been a really visible issue that would've been caught in testing on the first pass. However in this case the code in question was in a callback set with SetTimer() function. When the top-level UI code called DispatchMessage(), the control went to user32.dll, which issued the callback, the callback ran that code and the code crashed. You'd think what difference does it make, a crash is a crash... Yes, exactly. Welcome to the club. Apparently, callbacks issued by SetTimer() are framed by a pair of RtlActivateActivationContextUnsafeFast() and RtlDeactivateActivationContextUnsafeFast() calls, which set up and tear down their own SEH handler. So the timer callback code can crash all it wants and you'll be none the wiser. So what happened in Bvckup's case is that it would receive a timer callback, which will run its internal event loop. The loop will dispatch event handlers and one of them will throw a SEH exception, which will be promptly eaten by user32.dll instead of being passed up to the UI for reporting. This left the UI thinking that its event loop was still active, so on the next timer callback the UI would see that the loop is still busy and it would skip running it - hence completely stalling the event processing, including the reception of the updates from the engine. Long story short - set your exception handlers for all your callbacks from Windows API or end up seeing your code behave in a way that makes no sense whatsoever. restart. Now it doesn't, so - a progress. line control, which compliments nicely already present "load"
to check disk for mark-up and hardware errors as soon as possible. destination instead of being specified for local/remote location types. include backup runs that produced no changes. See https://bvckup2.com/support/forum/topic/1091 for the context. ⦁ Fixed an issue with delayed display of the copying progress. each other (because the UI typically starts some time after the service). recorded by the engine using this clock rather than the system clock. and appeared in the future => hence the delay. destination snapshot at the end of a backup run. machine's uptime goes over 49 days. This was a good one. buckets similar to "timer wheels" as used in the Linux kernel . code invariably decided that the next time was already past due. and that led to elevated idle CPU usage. BUT. You are rightfully thinking - how come this only affects 79.15? spotlight as there *is* a fair number of boxes with good uptime. All in all though, it's all compiler's fault. Entirely. commands and email alert templates. observed consistently. That would be the setting behind "Edit details"
next to "Backup Settings" > "When to backup" > "In real-time" option. ⦁ New module for monitoring storage devices, volumes and drives. program is running in service mode. ⦁ Resolved an issue with erroneously suppressing copying of "created"
folder (e.g. backup-0003) and etc_path is set to the folder's full path. ⦁ Tidied up the log produced by the storage tracking module. are first safely ejected and then plugged back in. mixed up in the log viewer's context menu. ⦁ Reworked monitoring of mapped network drives. 79.18 with introduction of the new storage tracking module. Kudos to Greg for reporting the issue and helping with isolating it. which is something it didn't do before at all. ⦁ Reworked reporting of ini/override warnings. when logging an INI warning. ⦁ Added workaround for buggy SD card readers. report that "the volume is not ready" when the volume is in fact A-OK.
information. The program can now tolerate this eccentric behavior. ⦁ Added workaround for strange 'sparse reparse' points. files. See https://bvckup2.com/support/forum/topic/1116 for details. attribute set. This can be disable in job's settings if needed. removed extraneous line breaks, etc. fixed hints in "Add new filter" window. disk space during the copying phase of backup. ⦁ Resolved an issue with logging of missed-a-run email alert failures. ⦁ 79.21.1 fixes a small color issue with the Welcome Guide. during scanning and planning phases. Keep in mind that the latest revision won't show up via in-app checks for updates if the installation already runs a 79.21 release. Instead it can be downloaded from https://bvckup2.com/update for a manual update. points at existing non-empty destination folder AND when "Deleting"
deleted or shrunk down to no longer qualify for delta copying. set on their backup copy. ⦁ Further UI improvements to double-buffered control rendering. ⦁ Reworked the program mode switching process. done asynchronously, in the background. unsure if they want to die completely or not, etc. when this request will fail. Previously, a volume like this was assumed to be faulty and ignored. So any jobs bound to this volume remained in "Waiting for device"
state and didn't get to run. volume will be marked as broken and ignored. as reported by the file system matches up with the expectation. or ExFAT, just plain FAT) that accessed remotely, through Samba. this check is basically meant to detect this combo and warn about it. check in the code and shut down the program. In good news, that sanity check worked as designed. have a problem with showing the right license status. state of the window when it was put into respective state. Keep in mind that the latest revision won't show up via in-app checks for updates if the installation already runs a 79.23 release. Instead it can be downloaded from https://bvckup2.com/update for a manual update. ⦁ Enabled collection of the device health data. data from local storage device, if possible. the drives (in theory it shouldn't, in practice - sometimes it does). plugged into the machine. This too is done asynchronously. log and the summary of it is also logged in the central program log. 79.18 introduced the new storage monitoring module, sans SMART. 79.23 switched the module to use asynchronous scanning. 79.24 enabled the gathering of the SMART data. data over time and integration into the UI as a first-class feature. the volumes to be re-queried perpetually, in 5 second intervals. looking and a bit more pleasant to read... if that's your thing. formed, throwing off device tracking. This should be fixed now. "Device Tracking" and "How To Send" dialogs.